Highest quality Smythe Sewn binding. Dark, easy to read print. Book measures 6.25″ x 9.25″ x 1.625″. Science and Health is the foundation to the study of Christian Science. It is known as the Christian Science textbook, containing the complete statement of Mrs. Eddy’s revelation. It brings to light the hidden meaning of the Scriptures and defines the spiritual laws underlying the healing works of Christ Jesus. Mrs. Eddy’s discovery of Christian Science was a great spiritual and scientific breakthrough. She saw through the veil of matter and discerned underlying the universe and man a spiritual cause creating, governing and sustaining reality. She recorded her vision in this textbook and so opened the way for others to understand the nature of this hidden realm. In Science and Health, she defines God as: “The great I AM; the all-knowing, all-seeing, all-acting, all-wise, all-loving, and eternal; Principle; Mind; Soul; Spirit; Life; Truth; Love; all substance; intelligence.” She explains the allness of God and the unreality of evil and matter, and provides a method of prayer that overcomes the fear of evil and the illusion of matter. 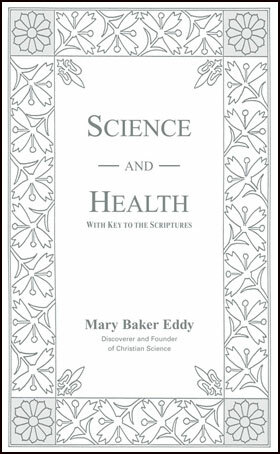 From the first edition of Science and Health in 1875, until this final volume in 1910, Mrs. Eddy continued to refine her work until she left us a textbook that places spiritual healing on a scientific basis. In a world that is constantly changing, it is reassuring to have a book that is so in advance of today’s thinking that it needs no changes. It is written for the ages. When you open it, you enter a world of thought that lifts you above discord and confusion into an atmosphere of Truth and Love. You have something stable and permanent to hold to – something that gives you hope and healing, peace and the quiet assurance that comes from knowing God.